The shooter is a true R -Sky kite! Shape and design are typical of the famous Roger Tessa Gambassi kite workshop. 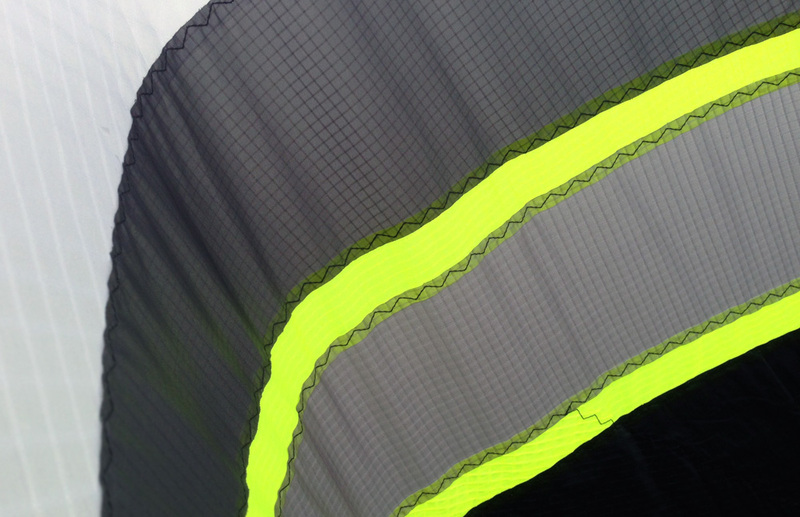 Richard Debray and the R -Sky team pilots are very successful with this kite and show that France is still absolutely top notch in sport kite technology. I tested the Ultra version with a suggested retail price of €289. It is, apart from the spine, framed with Skyshark 3 and 5PT. The slightly cheaper option costs €249 and is framed with P300 and carbon fiber. The Shooter is a thoroughly modern design, which is well trimmed for freestyle and is hardly overpitched. She is not a kite for light winds, and certainly not for light gusty winds! However, once applied steady 10 kph she develops into a “tracker” - pure French style! For its size, it does have enormous steam and so it happened that she tore my 40 daN Liros lines at around 25 kph. Apropos of lines, flown at 25m length, I found the Shooter too hectic, too sensitive and too aggressive. She then has little opportunity to run freely and calls from pilots lightning fast reactions and maximum slack control. 5 m more and she is clearly more adult. With 35 m lines she was for me a little too indirect - hence my recommendation: the Shooter is at its best at 30 m and that between 40 - 68 daN breaking strength. The power needs to be controlled. 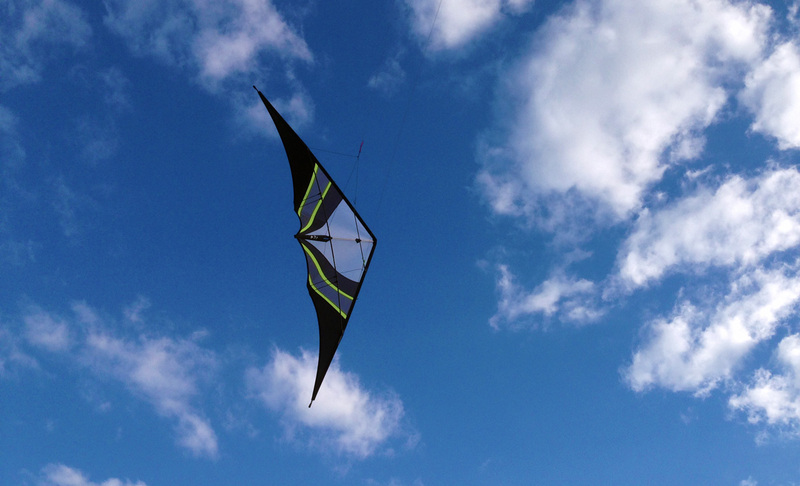 Roger has configured the kite with the ability to fly tight corners in a small space. The kite has a very tight turning radius, so the untrained pilots will have their difficulties not to “overshoot” the desired 90° degrees. But you get used to it quite quickly. The Shooter needs a tough hand and inputs around corners. 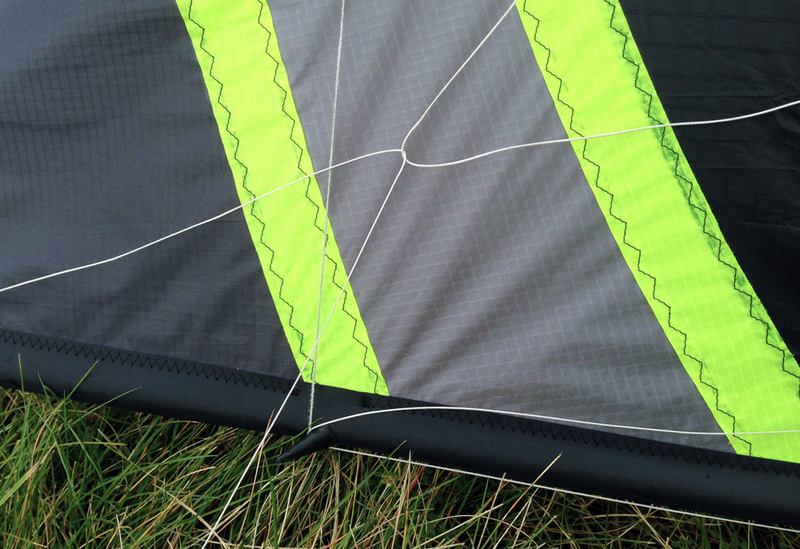 The kite’s sound is rather tinny, lacking a leech line and double stitched hem will produce a not too noisy but quite uniform tone. I have flown the Shooter at winds between 5 kph and 55 kph. I would recommend winds between 14 kph and 34 kph. Below that one quite often loses control and the propulsion is often not enough to fly properly. Over 30 kph she has a very powerful pull, but still tricks very easily. The interaction of pressure and low slack demand required, at least for me at first, a bit of getting used to it as you tend for very strong inputs when the kite is pulling strong. At first this seems slightly disproportionate, but then makes perfect sense. The straight line flying thanks to the enormous pressure is correspondingly good. Equipped with a three-point bridle, she does not need any special commands for push-pull inputs to accelerate out of the corners. 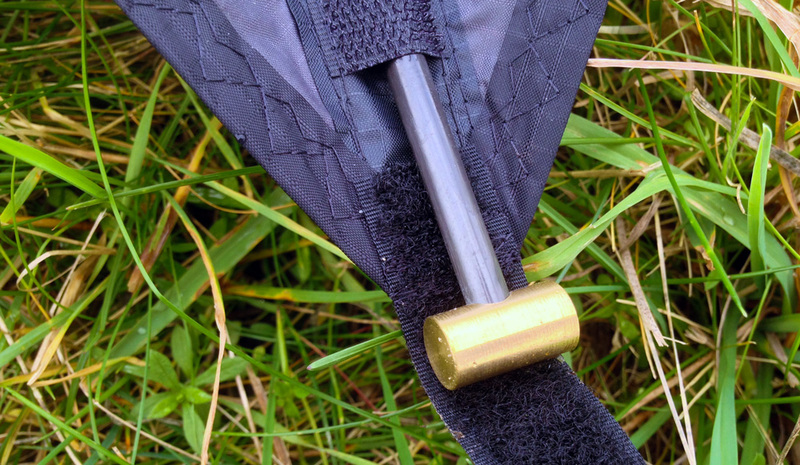 Speed ​​control is not a particular strength of the Shooter, it converts gusts very directly into propulsion. 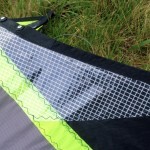 The generously used nylon panels do not help too much there unfortunately. The Shooter tends to over-steer tight turns or loops, which was more noticeable under 10 kph and with short lines (25m). I test flew the kite almost exclusively on the first knot (flatest) setup. Even in gusty winds often missing the sail pressure, it can happen that after an Axel she just falls towards the ground. She has a few quirks, but I would nevertheless entitle the Shooter a very easy and well-balanced modern freestyler. Designed for all modern tricks, the Shooter has an aggressive horizontal axis, but without getting stuck in a Turtle. The Turtle is deep, but not provided (as in many other current models) with auto-lift . That makes two-point landings from 10 kph pure bliss! Such a tight turning radius makes it a brute(?) even under full load to force a two-point landing without having to be afraid of losing her in the turtle, for that you have to keep the lines VERY tight! Yoyos go very fast without being uncontrollably. From the Fade the Shooter wraps even faster and so I celebrated WapDoWaps at 20 kph all the way to the end of the flying field - what a treat! 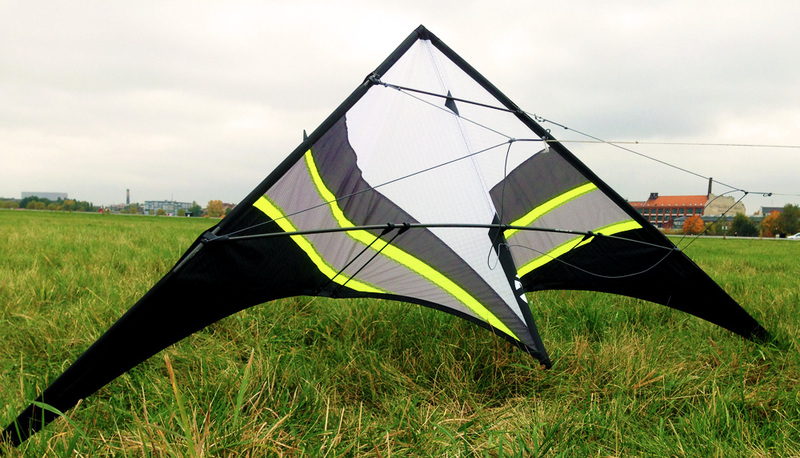 Negative manoevers like YoFade and CrazyCopter succeed as easy, but require, as opposed to more stretched kite designs such as the Toxic or Vortex, a little more fine tuned setup. But then moves are more accurate and look better in my opinion. A major criticism is the pressure buildup in the wrapped state! If you want to fly wrapped up, the Shooter begins to pump. 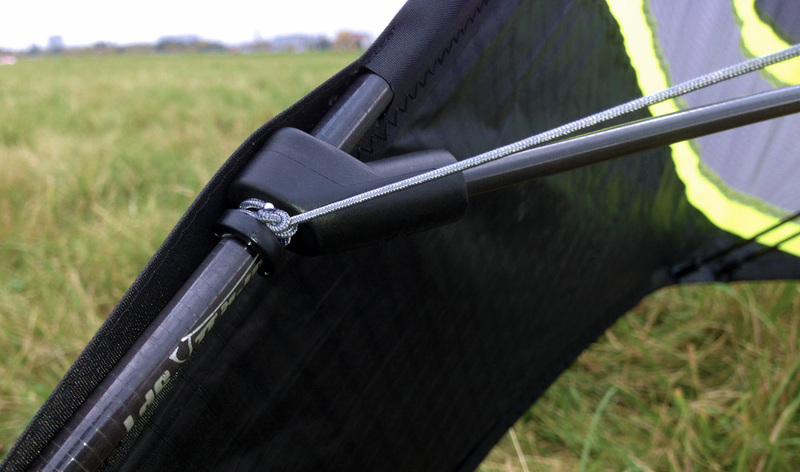 As soon as it receives pressure the kite swings on the horizontal axis and won’t allow a normal flight. The reason for this are probably too low mounted Yoyo stops. The Shooter needs a very concentrated slack hand, otherwise you lose it, as already written above, even with basics such as an Axel. The TazMachine needs a very short first impulse and immediate confirmation by the second, otherwise you lose control again immediately and the Shooter wraps up. If one has gotten used to these short commands, one is rewarded with wonderful Taz cascades without much effort! Yoyo TazMachines are super easy because it needs minimal commands for Taz and has zero ambition to fly further wrapped up - she un-wraps of her own no matter what wind. She spins incredibly quickly at Axel turns, so that the Axel Cascade needs short and fast inputs to prevent over-steering. For a descending Axel Cascade you need some more pressure on the sail. In the Pancake she has a blind spot way back. This is easily bypassed. For beginners, the blind spot in the pancake but can be quite annoying. Half-Axel to Fade, however is a challenge with low wind. She comes rather quickly and wobbly in the fade and the nose tends to come up high. If there’s no pressure built up, the kite becomes unstable and starts oscillating - well, that's in any modern stunt kite, but here I felt it as something distinct. The backspin is immediately triggered even without accurate setup. The fast rotation on the back allow for a tremendous speed in backspin. But this exactly requires a VERY strong stopping for a Backspin Cascade. If the Shooter isn’t stopped hard for the counter rotating backspin, she completely denies rotations in the opposite direction ! Comets with the shooter are a bit quirky. From flowing to akwardness is only a small step and she needs an accurate hand to fly fairly stationary or flying smoothly without major loss of altitude. If you don’t find this fine point, some of the energy dissipates in the (in that moment) too soft wings. However, if granted too much slack, she acknowledges that with one and a half rotations and subsequent total- pressure loss. Cynique worked for me (not my best discipline) relatively easy. Goffing (if you like this) can also be done relatively simple. Guided Multi Lazys (La pedals) are in whichever wind not her strength, because the Shooter is quite low but not particularly stable in the Turtle. Normally triggered Multi Lazys are on the other hand very unproblematic. The specified dimensions of R -Sky I could not follow, because I measured a standing height of 93 cm and a wingspan of 205 cm (210cm with spars) and a leading edge length (without spar) of 135 cm. The weight is about 260 g of which 10.5 grams are found in a brass weight at the spine end. 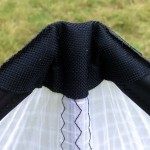 The inner bridle is attached slightly below the centre cross. The lower outer bridle has its place directly under the connectors. The spine is only 6 mm pultruded carbon fiber. 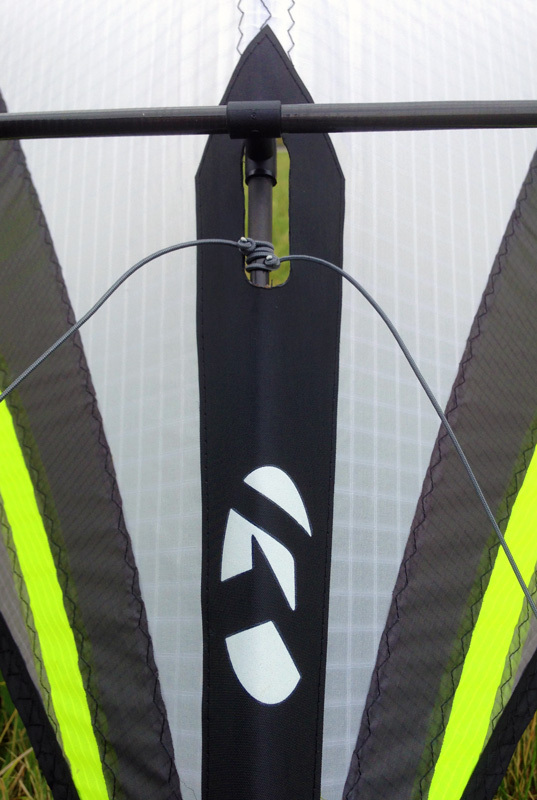 The nose is made of coarse Cordura, the top spreader sail protector made from Dacron. 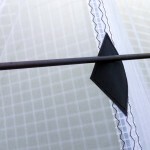 The stand-off re-inforcements are generously equipped with Mylar and stand-off connectors on the sail are common variants with a small bevelled washer. 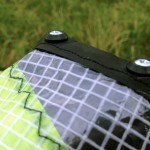 Otherwise R-Sky’s sail sewing makes sense and saves unnecessary frills. Accuracy and used materials are of high quality and are sensibly implemented! The shooter is, in my eyes, a well-built kite for straightforward fun. - At times I found myself with a line snag never experienced before.